Most certainly, the sunburst on the breast of St. Thomas Aquinas is a symbol of his teachings which, themselves illumined by divine truth, bear forth great light for the whole Church. Moreover, since true knowledge of God leads to the love of God and, since charity is properly depicted with fire and heat; the sunburst symbolizes the fire of charity which unites the believer to the Savior – filled with charity himself, St. Thomas has instilled the ardor of love in the hearts of countless faithful. In another way, the sunburst can be considered as a sign of the purity of the Angelic Doctor. It is well known that purity is a necessary virtue for any who would desire to penetrate the divine truths – for one who lusts after the vain pleasures of the flesh cannot raise his heart and mind to the contemplation of the hidden mysteries of the faith. And St. Thomas was a most pure saint: Early on in his life as a Dominican, St. Thomas had been captured and imprisoned by his family (who desired that he should be a powerful Benedictine rather than a poor friar). His brothers tested his virtue by placing a temptress in his room, but St. Thomas drove her from the cell with a brand which he snatched from the fire. Many years later, St. Thomas told his dear friend, Reginald of Piperno, that, when the temptress had been driven forth, he knelt and most earnestly implored God to grant him purity of mind and body. He fell into a gentle sleep, and, as he slept, two angels appeared to assure him that his prayer had been heard. They then girded him about with a white girdle, saying, “We gird thee with the girdle of perpetual virginity.” And from that day forward he never experienced the slightest motions of concupiscence. Blessed indeed the pure of heart, for they shall see God! and the primal origin raised high beyond all things. Whatever happened to the proto-veneration due to Saint Joseph? St. Jude is depicted with a medal bearing the face of Christ over his heart. You are correct that St. Jude is depicted with the face of Christ over his heart...however (as you mention), this is a medal which is around his neck. I'm not sure that St. Jude qualifies for a "heart" devotion in Christian art...it is not St. Jude's heart which is radiating and drawing attention, but the medal of Christ's Holy Face. St. Teresa of Jesus (of Avila) is often depicted with her transverberated heart and there is also a Carmelite liturgical celebration of her experience on August 26. I'm not sure how to take your comment... are you really asking what happened to the proto-veneration due St. Joseph? Nothing ever happened to it! It is certainly still there! Are you trying to suggest that the mere fact that St. Joseph's heart is not depicted in art is somehow an affront? Obviously, St. Joseph is greater than the other saints (besides Mary). However, this does not change the fact that St. Thomas is the only saint (besides Mary) whose heart is regularly depicted in Christian art (in the form of the sunburst) -- St. Augustine's heart is also occasionally shown. I don't know if I would say that Teresa of Avila is "often" depicted with her transverberated heart...but I agree that she is often depicted in the moment of her ecstasy... occasionally, her heart will be visible in the image. Still, without in any way intending to slight St. Teresa, I would have to say that there is a big difference between the way in which her heart is occasionally depicted in images of the ecstatic vision and the way that St. Thomas' heart is almost always depicted through the sunburst -- the sunburst isn't pointing to a specific moment in Thomas' life, but to the stable disposition of his heart. "I'm not sure how to take your comment... are you really asking what happened to the proto-veneration due St. Joseph? Nothing ever happened to it! It is certainly still there!" I'm just wondering why it's not as much emphasized as Saint Thomas. "Are you trying to suggest that the mere fact that St. Joseph's heart is not depicted in art is somehow an affront?" And this proves my point about so little emphasis and understanding of devotion to Saint Joseph. He used to be regularly depicted with his chaste heart, even when he wasn't depicted together with Jesus and Mary. "Obviously, St. Joseph is greater than the other saints (besides Mary). However, this does not change the fact that St. Thomas is the only saint (besides Mary) whose heart is regularly depicted in Christian art (in the form of the sunburst) -- St. Augustine's heart is also occasionally shown." Actually, it used to be that many, many saints were depicted with their hearts: Saint Margaret Mary, for example, used to be depicted giving her heart up to Jesus. But I wonder why Saint Joseph, who deserves greater devotion than all the saints next to Mary as her spouse, is not given the devotion he used to be given. I'm not saying we should be drawing more hearts or returning to old devotions, I'm just saying: What happened to the Josephine devotion? It almost seems foreign to hear of devotion to him in this day and age. After reflection I have decided that my comments were inappropriate on Saint Thomas' day. My apologies. Please ask Saint Thomas to pray for me, for I, who offended him on his day, am not worthy to ask for his intercession. I don't think that you are fully understanding my central claim -- I am not saying that no other saints' hearts have ever been depicted in Christian art. I am not even so much saying that there are no other saints whose hearts are occasionally depicted in art. This is my central claim: After Jesus and Mary, no saint other than St. Thomas Aquinas is characterized by this focus on the heart. Sure, Margaret Mary is pictured in the moment of the revelation of Jesus' Heart and her heart is sometimes shown. Sure, Augustine's heart is sometimes shown on fire. Yes, perhaps, St. Joseph's chaste heart is sometimes depicted. etc, etc. But, for none of these saints, is the depiction of their heart a central characteristic of the art dedicated to them. 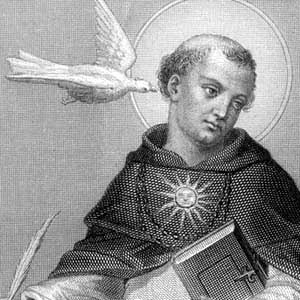 For St. Thomas Aquinas, the sunburst is THE CHARACTERISTIC, and it is always always always over his heart. I don't think that it is quite correct to say that something placed OVER the heart equals the heart. The sun disc is an attribute of St. Thomas Aquinas but its placement has been probably dictated more by the artistic logic than by any theological considerations, although the idea that the intellect is located within the human heart has certainly played some role here. However, talking about a VENERATION of St. Thomas Aquinas' heart is going way too far. All I ever said was that there is an artistic devotion to the heart of St. Thomas, which devotion is depicted through the sunburst. Does anyone else find it strange that not a single positive comment has yet been made? Why is it that most of those commenting thus far have explicitly attacked the simple fact that the sunburst is over Thomas' heart? What do you think? Does you have anything to add (positively) about the heart of the Angelic Doctor? I remember G.K. Chesterton commenting on the sun disk in art of St. Thomas in his biographical meditation on the Saint. I've also always been fascinated by the sunburst on St. Thomas Aquinas but have never given time to meditate on it. I think your comments really do shed light on it. I know that Garrigou-Lagrange constantly defended St. Thomas as being through-and-through Christocentric in his teachings and not a mere, external application of Christian ideas to Aristotelian philosophy. Oh, and I love that prayer before study by St. Thomas. I have prayed it quite often. I have always found it curious that the greatest theologians were those Saints whose love for God was the greatest, Mary as the preeminent theologian. I once read of a comparison between St. John Vianney and St. Thomas Aquinas--how the two, though radically different in the intellectual sphere, were quite complementary in their teachings on God and the Christian life. Well, I'm done with my mental ramblings! Thank you for all your work; it helps a lot! God bless. @Richard G., Thanks for the tip about G.K. Chesterton! I will have to take another look and see if I can find what he says! Also, I find it quite fitting that you mention Fr. Garrigou-Lagrange, he too was a great theologian and a man of intense charity -- it is well known that he had a great apostolate for the poor in Rome. Blessings to you in Christ our Savior! Chesterton ("St. Thomas Aquinas", New York: Sheed & Ward, 1933, p. 153) speaks of the sunburst as "a rather curious emblem as if it were some third symbolic and cyclopean eye". He also calls it "no normal Christian sign" and "something more like the disk of the sun such as held the face of a heathen god". Even though he concludes that "its imaginative meaning is strangely apt", GKC nowhere draws a parallel between it and the saint's heart. You have admitted that the sunburst is "conceptually related" to the heart...this is all I have claimed, that the sunburst is related to the heart of St. Thomas and that this sunburst is THE CHARACTERISTIC of St. Thomas in art. Again, I never have said that the sunburst IS St. Thomas' heart. Have you even read the post? What is your problem? I wrote: "NOW LET ME BE CLEAR, I am NOT claiming that the sunburst so often depicted on St. Thomas’ breast is literally his heart." I also wrote: "The sunburst on the breast of St. Thomas Aquinas is a symbol of his teachings." Again, I said it is a sign of "the purity of the Angelic Doctor." It strikes me as very interesting that you react so negatively to this little devotional piece offered in honor of St. Thomas. I am simply sharing a little reflection -- I am not making that bold of a claim...there is a sunburst over the heart of St. Thomas, this is something which is somewhat particular to St. Thomas, this peculiar artistic devotion has led me (and others) to think of Thomas' heart. "It strikes me as very interesting that you react so negatively to this little devotional piece offered in honor of St. Thomas." If mentioning the heart of a saint is "mildly idolatrous", I can only begin to guess at what you think of the images of St. Augustine's flaming heart, or St. Teresa's transverberated heart...how wildly upset you must be when someone mentions that St. Philip Neri's heart was physically enlarged or that St. Charles Borromeo's heart is incorrupt. Now, I do see that you ended your indicative sentence with a question mark -- "That's perhaps because I feel a little uneasy...about the mildly idolatrous connotations of your observations?" -- so that makes me feel a little bit better "?" Then again, you are clearly the learned doctor here... so many of the wise scorn the simple devotion of the faithful, how many before you have concluded that love for the saints is a form of idolatry! On the other hand, I am glad to see that you took the time to read at least the first two paragraphs of my original post. Thank you for that courtesy! Thank you Fr. Reginaldus for this post and especially "The prayer before study." I valued your introduction and it does lend toward some contemplative thought. "...St. Thomas Aquinas and his teachings act as a beacon of orthodoxy in a world of diverse approaches in theological history." And he adds a commentary on the painting "The Triumph of Saint Thomas Aquinas" by Benozzo Gozzoli: "As Thomas sits in honor at the center of the composition, an array of his writings are spread open over his lap radiating beams of light as does the sunburst over his breast (a symbol of Christian wisdom that connects Truth and Love)." Certainly Thomas beams forth from his pure heart rays of truth and love in upholding and instructing orthodoxy within the Church. And how true are his words today in a society easily led here or there as the whim and wind of media leads. I don't think I would venerate the heart of St. Thomas as much as I would pray to him for help in understanding all God has for me and for upholding orthodoxy within the church. What I don't quite understand is why there seems to be such a lack of following his wisdom within the Church....this may be a dumb observation. Perhaps the greatest lesson he gives by example is what you say at the end. "Blessed indeed are the pure of heart, for they shall see God!" Thanks again for a thought provoking post. I continue to keep you in my prayers, please pray for me. Do not be the least bit discouraged by those who have no love for St. Thomas. Recall that Vatican II was the first ecumenical council to explicitly recommend St. Thomas as the "sure guide" to theology. Indeed, in the past 100 years there has been a great renewal in authentic thomism, especially in the english speaking world -- here we can recall the relatively new focus on Garrigou-Lagrange (the great thomist of the modern era). Very few priests of the JP II generation will object to the devotion to St. Thomas -- I am convinced that many will begin look to him as a true Doctor, the Common Doctor of theology. Thanks for the quotation from Fr. Morris... very inspirational (the OPs are our great hope!). is there a connection between St. Thomas' sunburst and St. Dominic's "corona", which is always depicted above his head? I like the idea of the symbol of Christ's light brought to the world by St. Dominic's mind 'migrating' to the heart of his most famous son. And let this com box back-and-forth be a lesson to you! Serves you right for publishing something interesting and substantial. I love the connection you have made between Dominic and Thomas! Most especially, I love that you have connected the intellectual light with Dominic and the illumination of the heart with Thomas! Far too often people try to present Thomas as a cold intellectual who had no heart; and, occasionally, some will also present Dominic as a fun-loving friar without much of a mind. You have corrected both! Firstly thank you for another wonderful and thoughtful post. I would like to offer some positive criticism (If there is such a thing! :) ) about the combox. It seems to me that in some cases you might be too hasty in taking an adversarial approach to the comments of readers. Perhaps it is possible that many of the readers above are not making negative comments but instead that interpretation of them is the default. It might be a useful policy to only reply to comments that have an obvious, explicit and serious error and those comments which ask a questions (preferably only the non-rhetorical ones). Otherwise it seems that the quality of the discussion is even further lowered. The internet doesn't tend to produce a clear, convincing reasonable dialogue delivered in charity. The best policy is to prudentially pick what is worth engaging in. That is what I have to offer, I hope it isn't taken with any offence. It is a great act of charity to correct a brother, thank you! I hope you will feel free to comment on future posts as well. Blessings to you in the Lord. thanks for your feedback. Of course, I would like to advance the notion that the Church, not I, has made a connection between the light of mind and heart, and Ss. Dominic and Thomas! A fourth heart, more "cordiale" than the Angelic's sunburst: St. Gertrude the Great is almost always depicted with a heart, sometimes the Sacred Heart, but usually her own heart, often with the Child Jesus within. I had forgotten about St. Gertrude the Great ... indeed, you are most certainly correct, there is a devotion to her heart as well! -- whether it be the Sacred Heart or the Child Jesus over her heart. I don't know if you've had time to search out the quote by Chesterton, but I've just come across it (I'm reading his "St. Thomas Aquinas" at the minute). "That secret sun, dark with excess of light, or not showing its light save in the enlightenment of others, might well be the exact emblem of that inner and ideal life of the saint" [Chapter V. 'The Real Life of St. Thomas]. Some of the comments others have made show that there is still a great deal of resistance to Thomism in the "modern" Church. Also, thanks for the incentive to go back and re-read chapter V of Chesterton's biography on Thomas! I thought the image represented the Eucharist dwelling in St. Thomas. I thought that because one of my catechumens (I am an RCIA instructor), had a lot of difficulty with the teaching on the real presence, but in the end, accepted it on faith. On the day she received the sacraments of initiation, she was the only one of my students thus far to report a mystical experience. She said she felt that the Eucharist descended into her soul in the form of a sun. This woman was very down to earth and in no way inclined to self-aggrandisement that I ever noticed. Does anyone know of anyone linking that image of the sun to the Eucharist?